Silicon Valley giants faced aggressive grillings by the Senate and House Intelligence Committees Wednesday over the role their platforms have inadvertently played in Russia's meddling in U.S. politics. Lawyers for Facebook, Twitter and Google were repeatedly criticized by lawmakers for what they portrayed as a lack of effort in addressing foreign meddling on their platforms in the past and pressed to account for what steps they would take in the future. During its hearing, the House Intelligence Committee officially released a sampling of Facebook ads and Twitter handles tied to the Russian troll farm known as the Internet Research Agency. 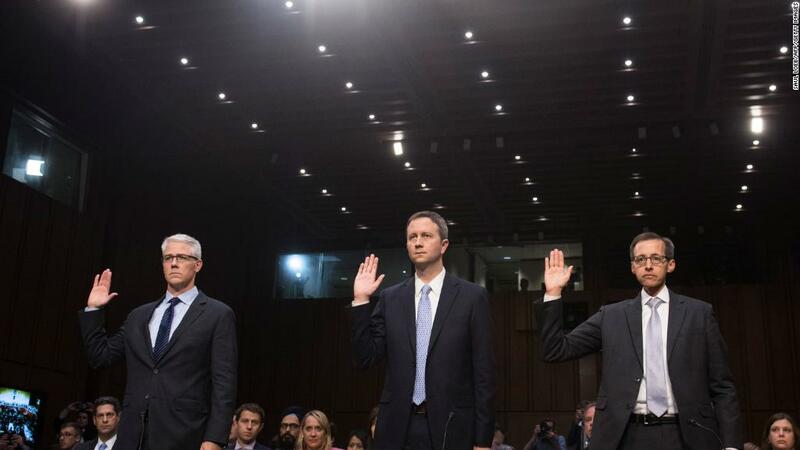 The Senate hearing, meanwhile, was notable for being the most aggressive and confrontational of this week's hearings on the issue, and saw the lawyers for all three companies acknowledging that they needed to do more in order to combat bad actors on their platforms. "I hear all your words, but I have more than a little bit of frustration that many of us on this committee have been raising this issue since the beginning of this year, and our claims were frankly blown off by the leadership of your companies, and dismissed," Sen. Mark Warner, the top-ranking Democrat on the committee, told the lawyers. "We've raised these claims since the beginning of the year, and the leaders of your companies blew us off," Warner said. "Your earliest presentations showed a lack of resources, a lack of genuine effort and a lack of commitment." Warner's fellow Democrats were similarly tough on the companies. Sen. Dianne Feinstein, who was present for both Tuesday's hearing and Wednesday's, said she was disappointed in the lawyers' answers to lawmakers' questions. "I don't think you get it," Feinstein said. "What we're talking about is a cataclysmic change. What we're talking about is the beginning of cyber warfare... You have a huge problem on your hands." Sen. Ron Wyden said, "We'd like to walk out of here knowing the changes you're going to support." Sen. Richard Burr, a Republican who chairs the committee, went so far as to suggest Congress could supply the companies with "anti-trust waivers" to allow them to collaborate in confronting foreign meddling. Lawyers for all three companies stressed that they did take the problem seriously and outlined some of the steps they have been taking to improve their checks on bad actors. "We're deeply concerned. This is an issue that we talk about constantly," Sean Edgett, Twitter's acting general counsel, said at the hearing. "The first part of this year, we pointed out entire engineering, product and design team on tackling the issues of information quality, abuse of our systems and protecting our users." Colin Stretch, Facebook's general counsel, said at one point that Facebook had more than 10,000 people working on safety and security and would have more than 20,000 people working on those fronts by the end of 2018. When pressed in a later exchange, however, Stretch could not say how many people at Facebook are focused primarily on addressing risks posed by state-sponsored operations. Each general counsel also struggled to name an executive at their company who is specifically tasked with overseeing the threat. At the same time, the lawyers stressed that the problem of Russia's meddling went beyond their companies and would require help from Congress and from other industries. "This is bigger than any one company," Stretch said at one point. Stretch also disclosed that reach of Russian-backed political content on its platforms was greater than previously stated. Content generated by the Kremlin-linked troll farm known as the Internet Research Agency reached nearly 150 million people through Facebook and Instagram, he said. Facebook had previously disclosed that 126 million accounts were served that content on Facebook. It is not clear how many of the 150 million people who were served that content actually saw it. All three companies said they saw Russian activity on their platforms as early as the beginning of 2015, before the presidential election kicked off in earnest. Members of both the Senate and House committees also used their time to highlight specific Russian-backed content and the influence it had on American voters. In perhaps the most notable moment of the Senate hearing, Burr highlighted an instance in which two ads created by Russian trolls -- one by an account called "Heart of Texas," another by an account called "United Muslims of America" -- promoted two opposing events at the same location on the same date in Texas. Experts have said that the Russians' goals included promoting discord in the U.S. and inciting violence.